The Thunder, presented by NJM Insurance, are pleased to share the 2019 schedule of dates at ARM & HAMMER Park where post-game fireworks will take place during the summer. "I'm excited to reveal the first stage of our 2019 promotional schedule as we get set for another season of affordable, family-friendly entertainment at ARM & HAMMER Park," said Thunder GM/COO Jeff Hurley. "Every year we hear feedback from our fans about how much they enjoy our post-game fireworks shows and I am thrilled to begin our preparations for next season right now!" The 2019 promotional schedule will feature 22 post-game fireworks shows on select Wednesday, Thursday, Friday and Saturday nights throughout the season. The first show of the season will take place on Saturday, April 27 when the Thunder host the Erie SeaWolves (Detroit Tigers) at 7:00pm. 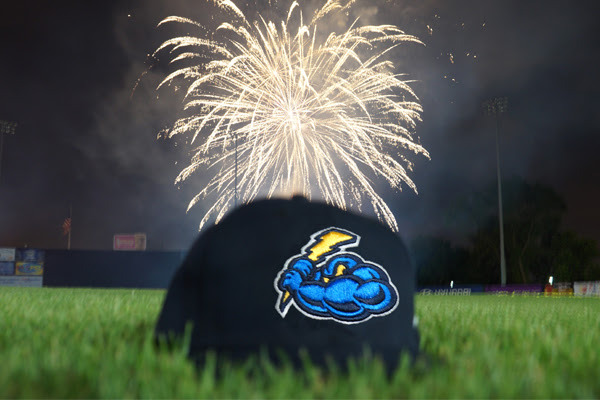 The months of May and June will feature six post-game fireworks shows while July and August will feature four each with the final show of the season taking place on Sunday, September 1 when the Thunder host the Reading Fightin Phils (Philadelphia Phillies) over Labor Day Weekend. Musical themes for 2019 fireworks shows and other promotions and giveaways will be revealed at a future date. The 2019 season will begin in Erie on Friday, April 5 at UPMC Park. Opening Night at ARM & HAMMER Park will take place on Friday, April 12 against the Portland Sea Dogs (Boston Red Sox). Full and Half Season Ticket plans as well as Group Tickets are on-sale now by phone at 609-394-3300. Stay up to date with the latest news and information on Thunder baseball, presented by NJM Insurance, by signing up for Fun on Deck; the team's bi-weekly email newsletter. CLICK HERE to sign up.